P2PTRADE.IO is the first binary options broker based on the Ethereum blockchain. Hello, dear Bitcointalk users! We want to introduce you a new product in the world of binary options trading. The platform was created with one goal: to provide an opportunity to made a fair trading. The business model is designed in such a way that it is beneficial for a broker that you trade and make a turnover from which the broker earns a commission. Provably fair: Platform earnings depend on trading volumes, not on traders losses . No deposit: Your funds (ETH) are not stored in the platform accounts but in the MetaMask browser wallet, to which only the trader has access. Instant payouts: Withdrawals takes place automatically upon ending of expiration immediately to MetaMask wallet. To trade on the platform, you need to install the Ethereum browser extension of the Metamask wallet, and have ETH on your balance. No verification. 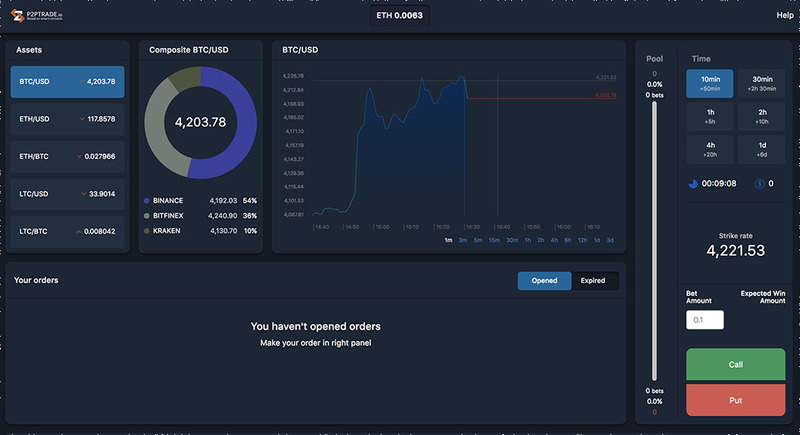 The platform does not affect the trading process and provides only the opportunity for traders to trade among themselves, everything is automated and works through Ethereum Smartcontract. Minimum transaction amount: The minimum amount is 0.1 ETH, or about $ 11 at the time of this article writing. This amount is provided by the logic model of platform so that when the ETH network have high load, the transactions reach without any problems. Quotes: On the platform, there is the function of tracking quotes in the "real time" mode. At the moment, there are only quotes of cryptocurrency pairs. In the future we plan to add other popular assets. Unlimited trading: Trades in any amounts, on any strategies. No prohibitions and restrictions. Expiration Time: The maximum expiration time is 7 days. Minimum is 60 min. We are working to reduce the time, everything depends on the functionality of the Ethereum network. P.S. A lot of updates are being prepared on the platform, broker content, manuals, referral program and mobile applications. Stay tuned!